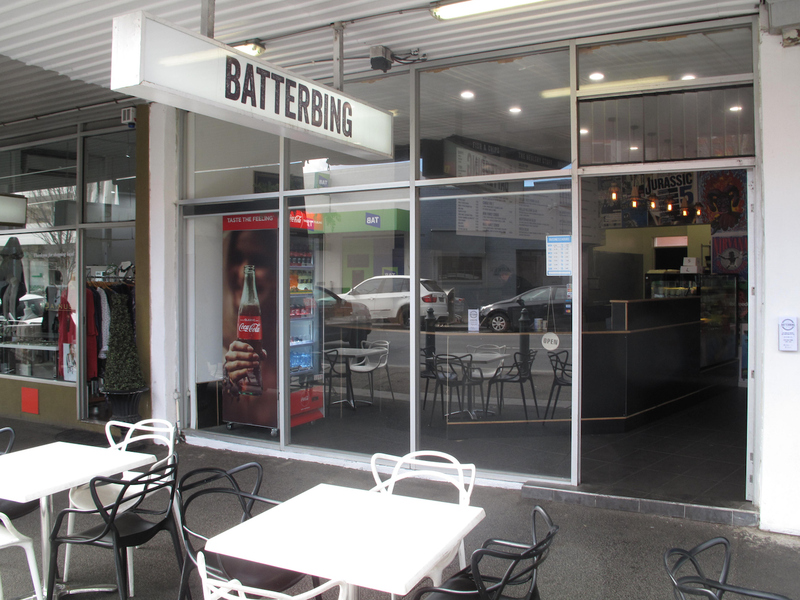 Batterbing is located in a Douglas Parade premises that has been home to fish and chips for a long, long time. Can any Williamstown readers tell us? 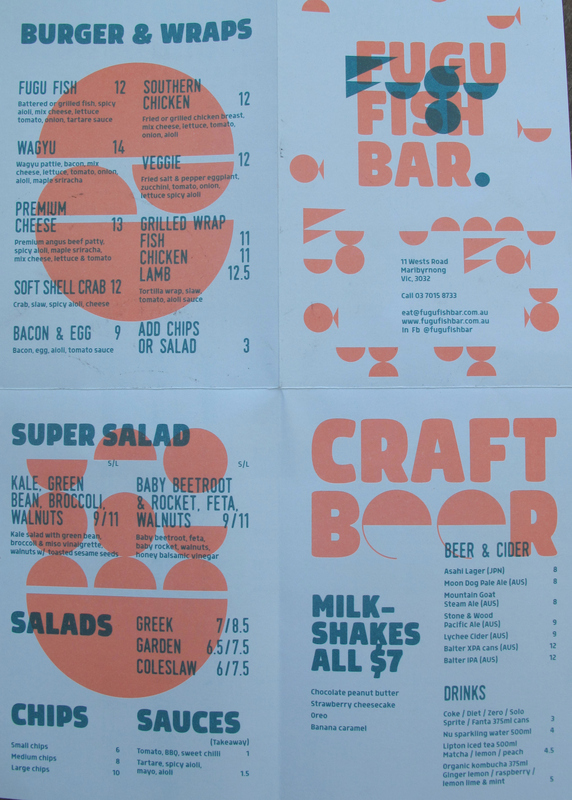 In any case, these days – under its newish name – it’s being run by John McMonagle, whose work we loved so much at Dough! in Newport. 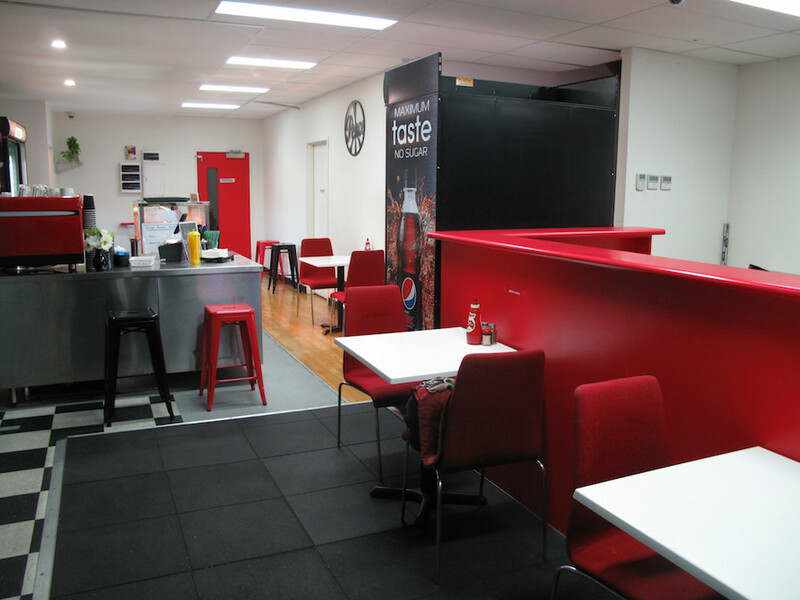 His Williamstown location is superior – it’s handily placed for more drop-in and foot traffic. And that’s great – it means more people can enjoy the super work being done by John and his team. 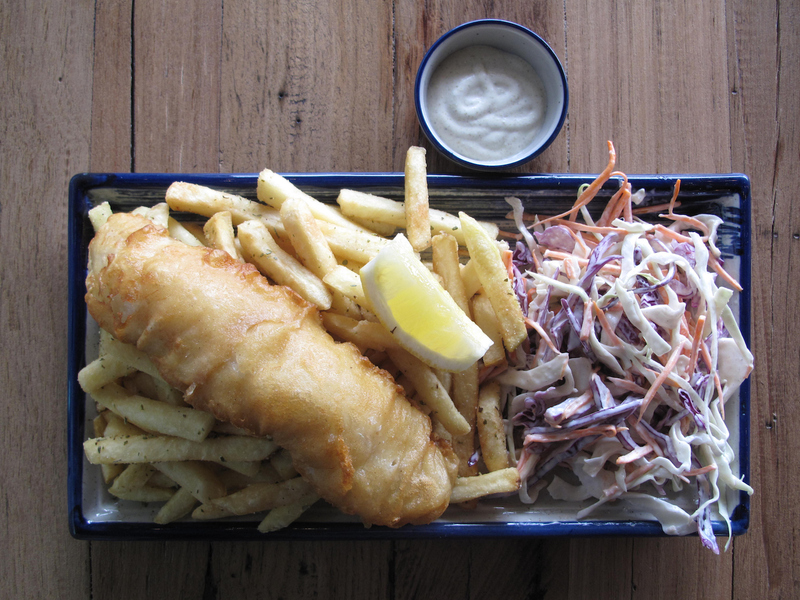 The place remains very much an old-school fish and chip shop, with rudimentary dine-in facilities – a bench and stools inside, a few tables and chairs on the footpath outside. 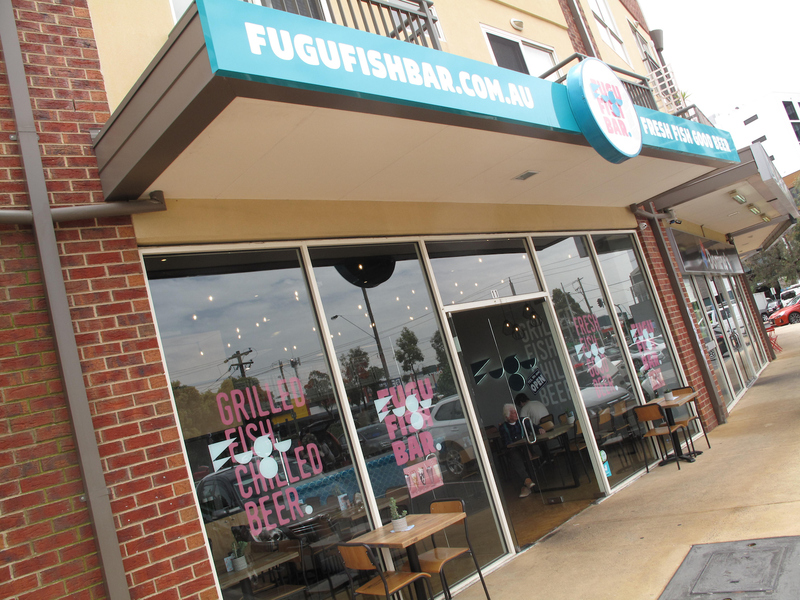 Here be made – and happily consumed – what are, in our opinions and experience, the best fish and chips in the western suburbs. 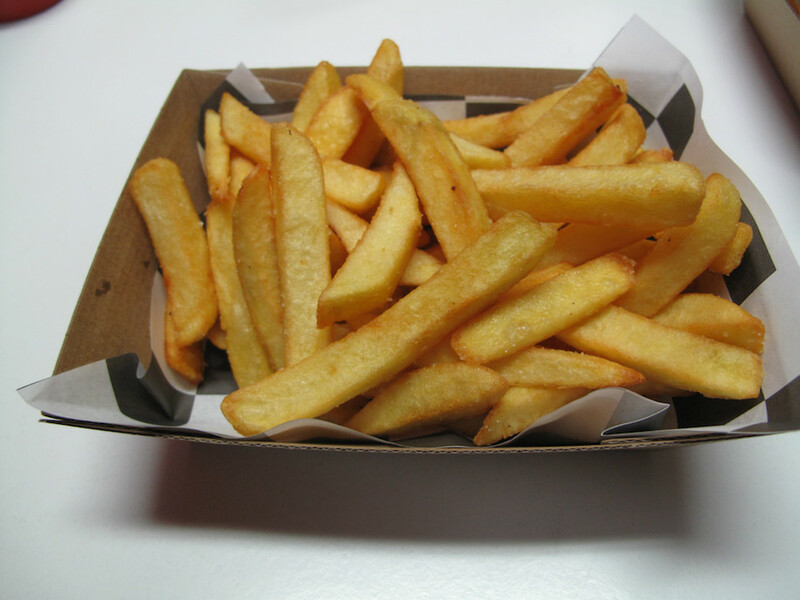 The Batterbing art starts with chips. 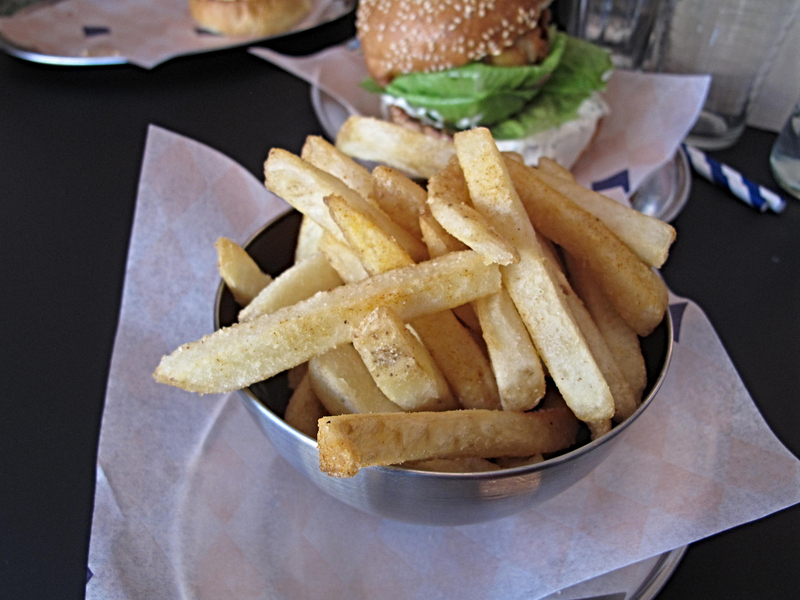 Here the potatoes are hand-cut and tumbled – and are wonderful. 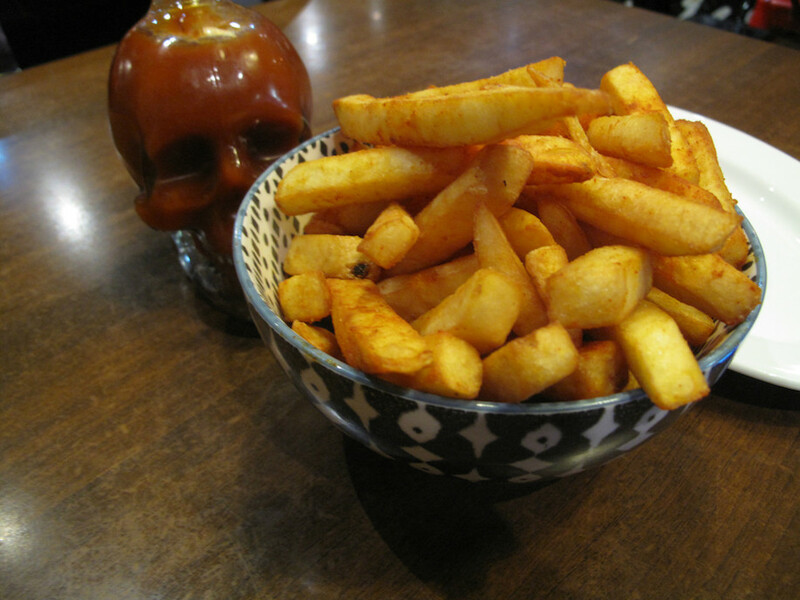 Real spuds make for hip chips. I go with my never-fail arrangement carried over from the Dough! days – now officially called Combo for 1 ($15, top photograph). 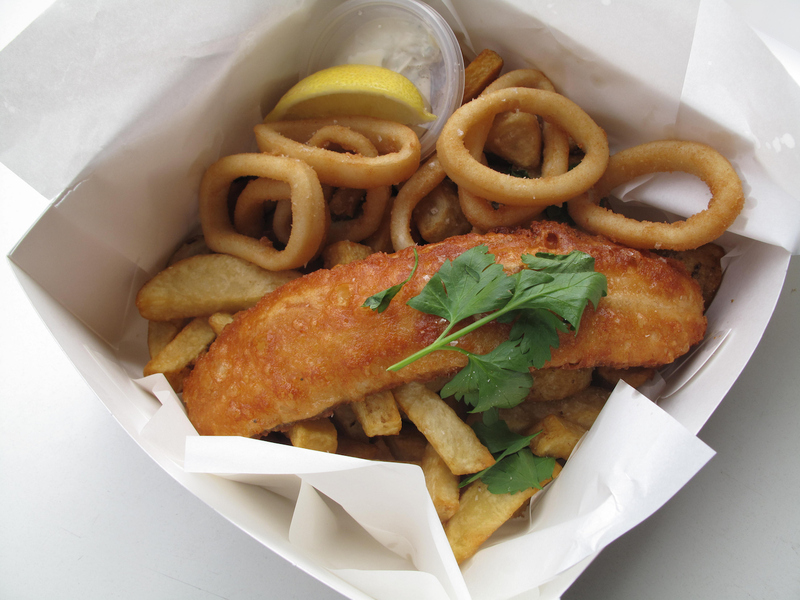 Those chips, a handful of tender calamari rings and a nice chunk of juicy, delicious and expertly deep-fried blue grenadier. Unlike Dough!, there are no pizzas at Batterbing. 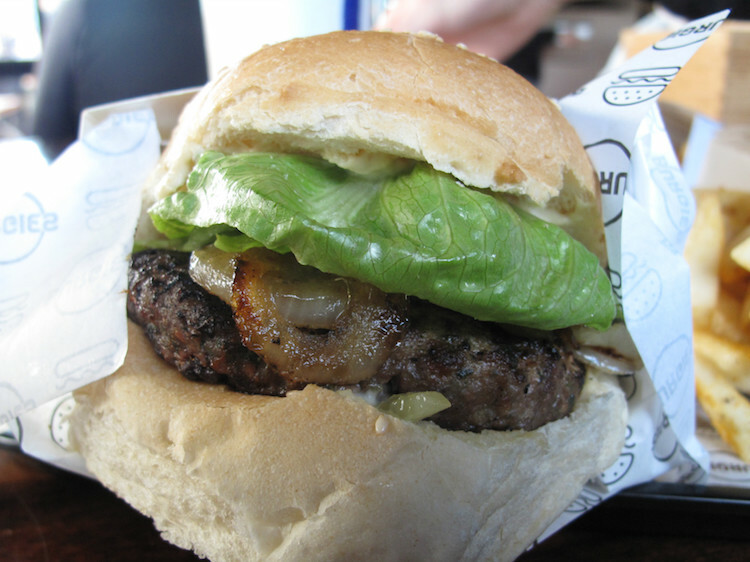 But there are burgers – so we take one of them for a run, too. The Lil Jerry Seinfeld – is there some in-joke I’m missing? – is a doozy. 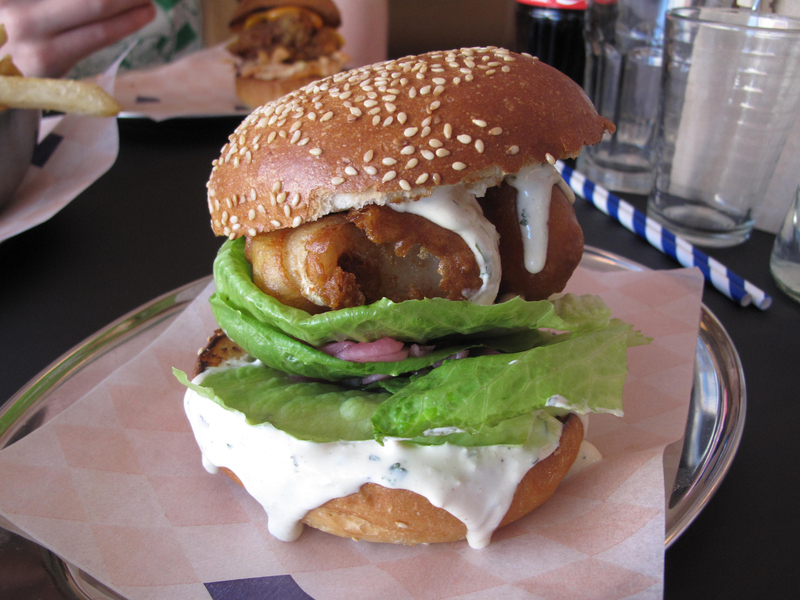 Crisp and deeply tanned deep-fried chicken thigh is joined in burger harmony by just the right amount of slaw and mayo in a purple bun. 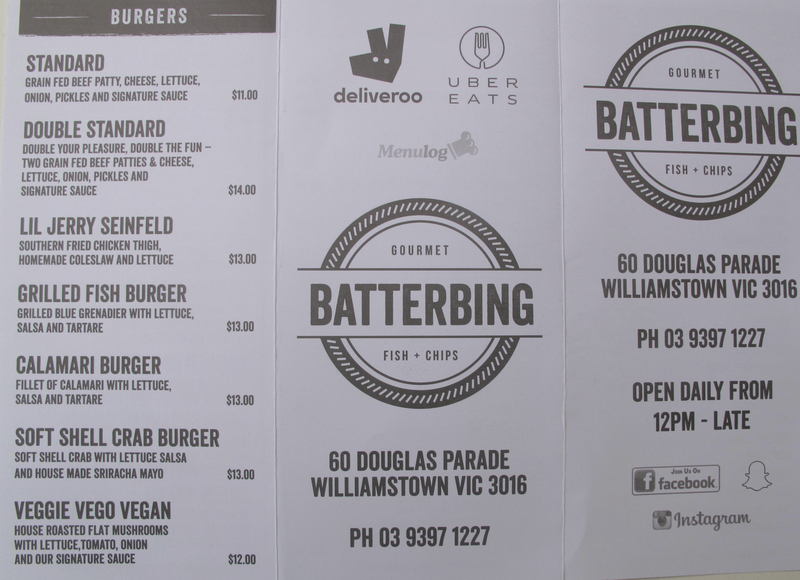 Like all the Batterbing burgers, it comes with a side of those chips – and that makes the $13 entry fee a dead-set bargain. 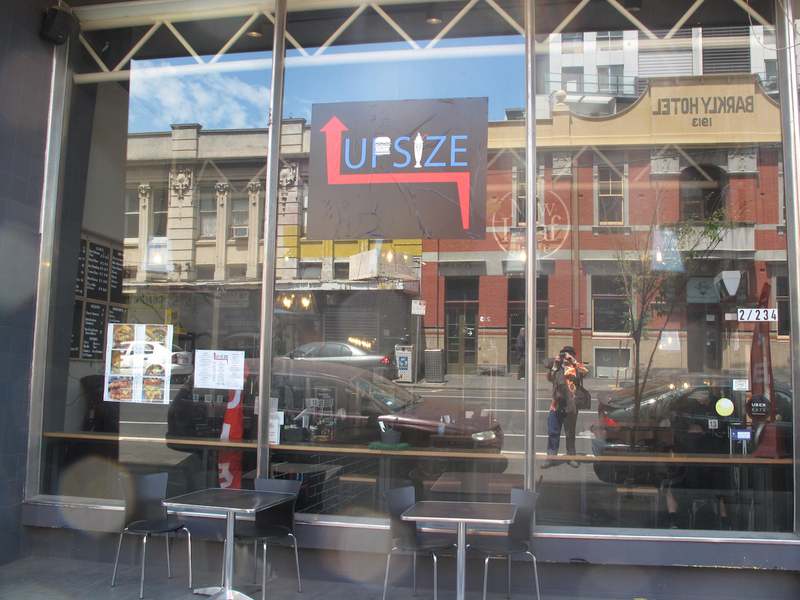 Upsize Burger Bar, 2/234 Barkly Street, Footscray. 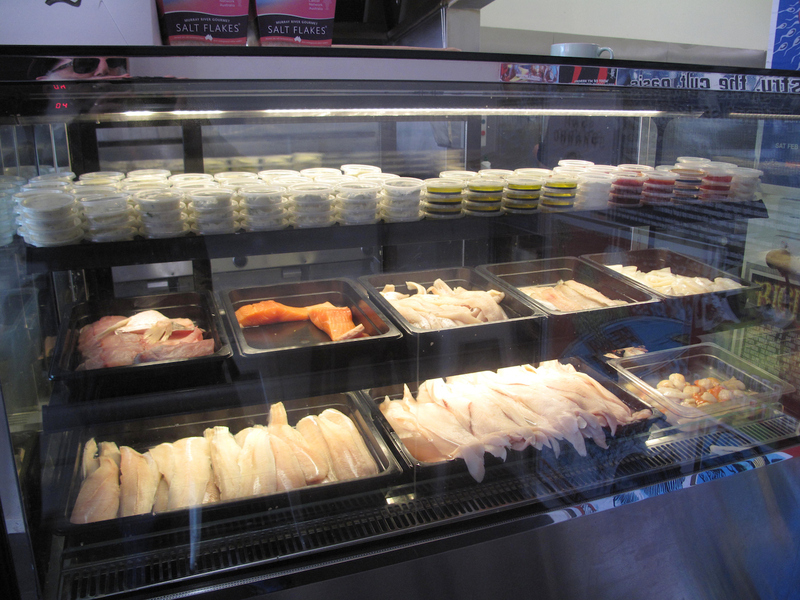 Consider The Sauce – leastwise, the senior partner thereof – has no truck with burger towers. Well, no truck with the eating of them. 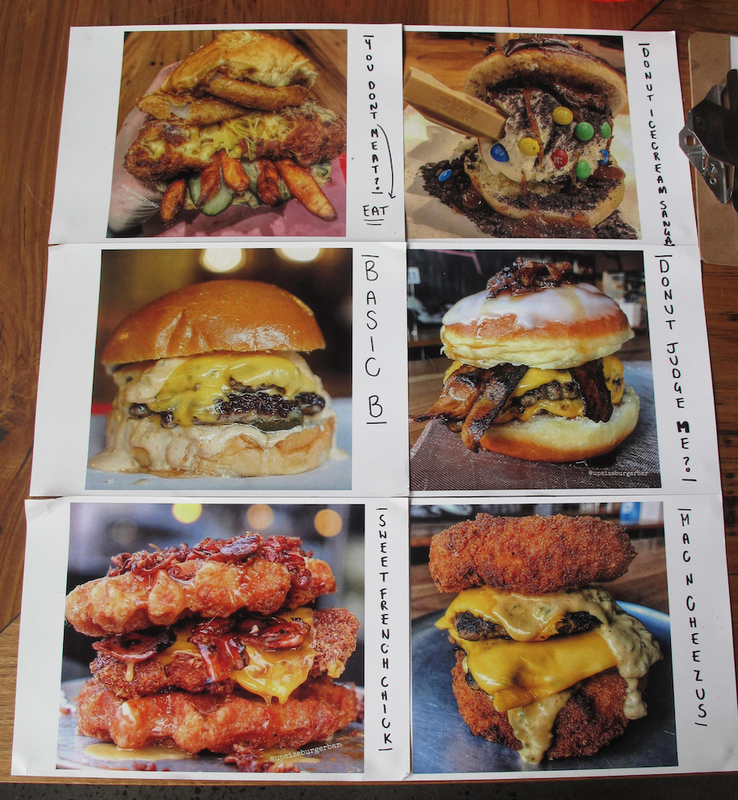 But I confess to being intrigued by these burger equivalents of skyscrapers. Which is just as well, because my Facebook feed regularly features photos of such things. But, nope – if it cannot be grasped in two eager hands, and/or requires a knife and fork, not interested in eating. Though I suspect, if Bennie was given free rein, he’d be right into exploring what seems little more than macho posturing to me. In that regard, I accept I am in some sort of minority and that there is widespread interest in, and fandom of, this particular burger cult. 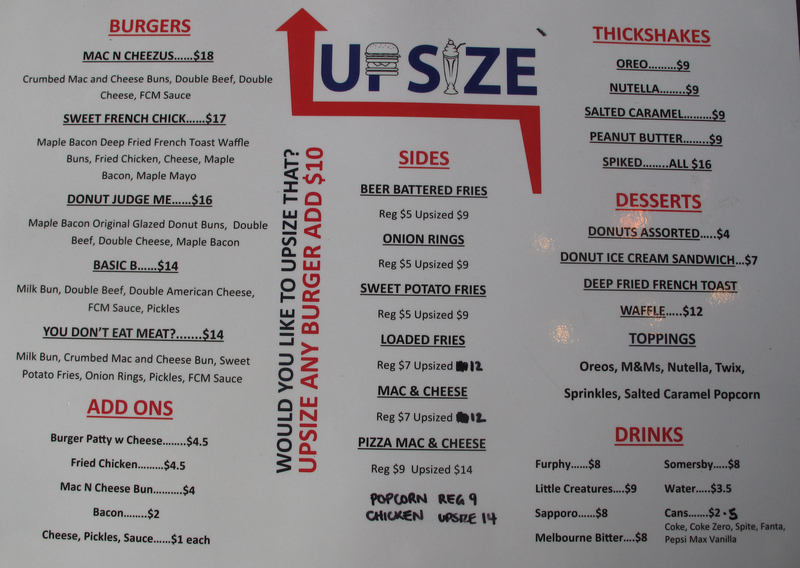 Upzsize Burger Bar is catering to it with panache, with many sorts of flamboyant arrangements – including using donuts and mac-n-cheese as buns! The in-house photos illustrate some of the more conservative options available. 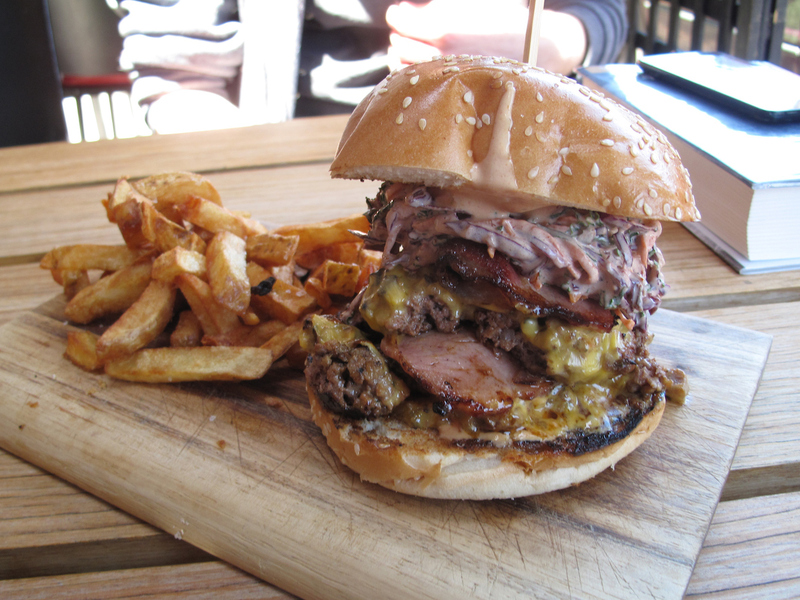 On the place’s FB page are to be found many spectacular examples of high-rise burger architecture. 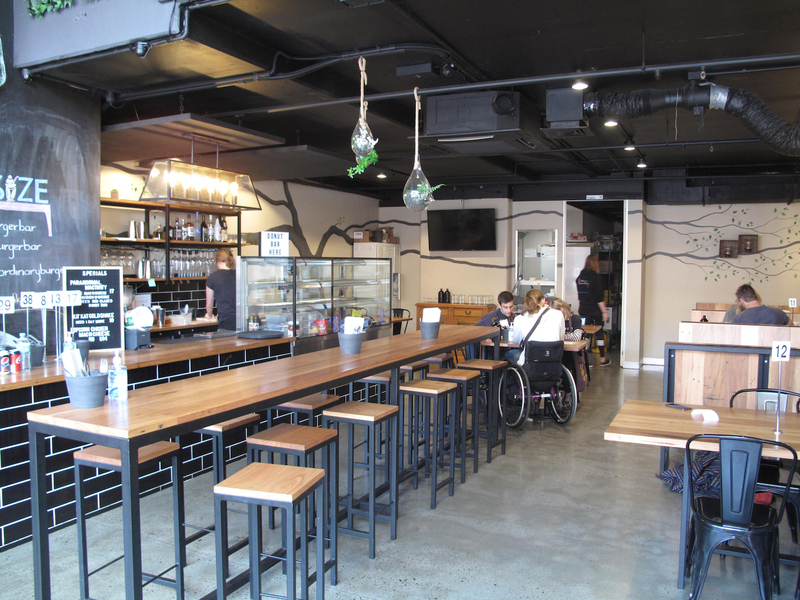 The Barkly Street joint is something of a temporary exercise. It’s open on Friday, Saturdays and Sundays – and only for three more weekends (making its last day Sunday, November 25). 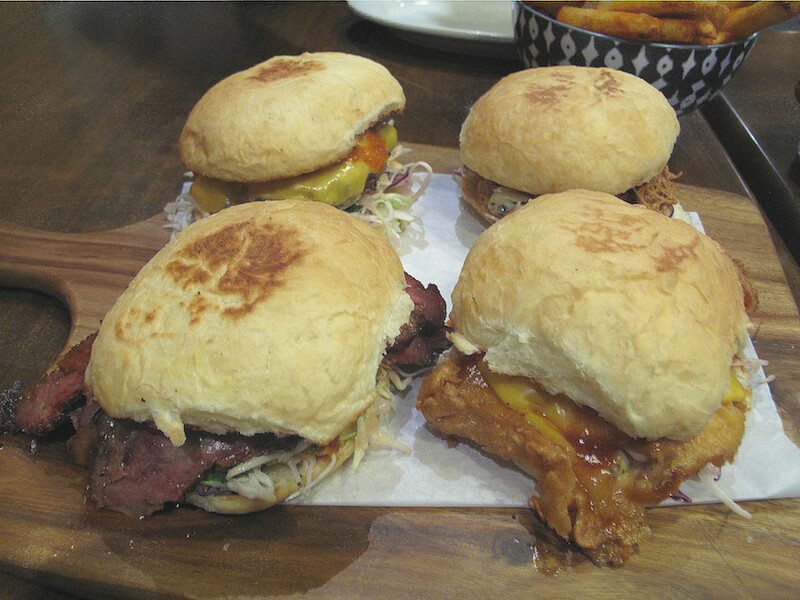 We are happy to explore Upsize to the extent of their regular burgers – and we enjoy doing so. 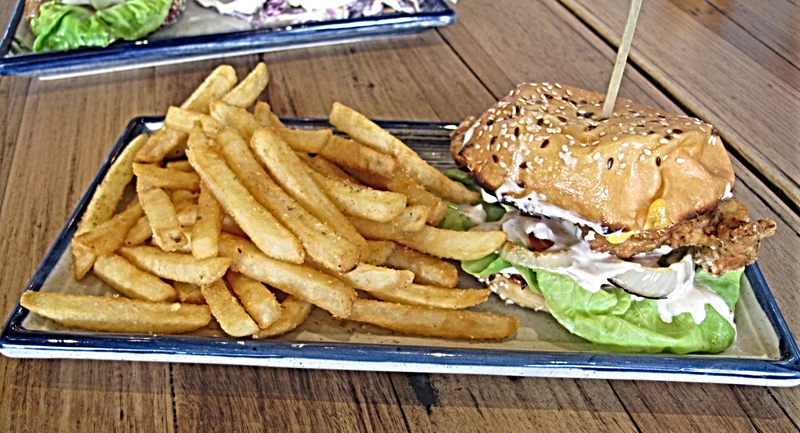 My Basic B ($14) is a good, solid, workmanlike burger. 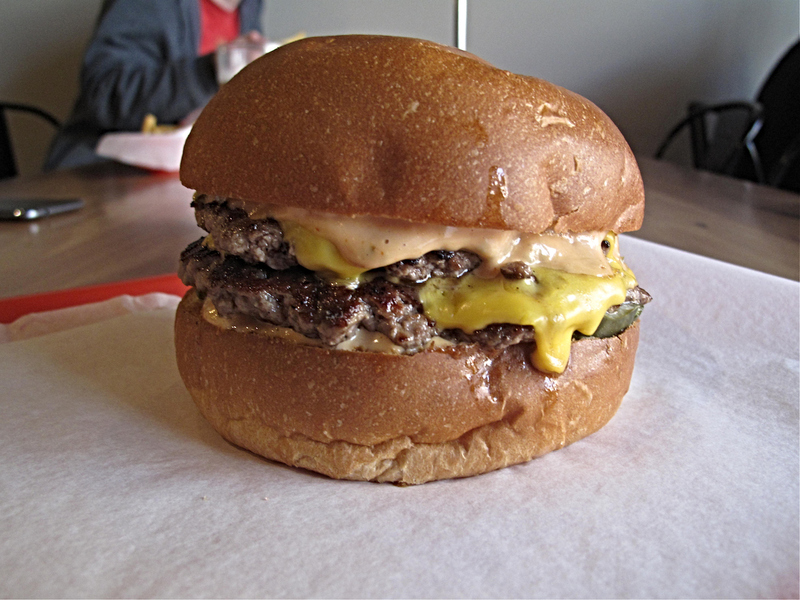 It has two beef patties, American cheese, “FCM sauce” and pickles – and goes down fine. Bennie chooses the chicken equivalent for the same price. The chicken is crisp and the slaw delivered in appropriate amount. We both much enjoy that the pickle slices are so plentiful that they constitute a strong flavour component, as opposed to the usual mere whiff. 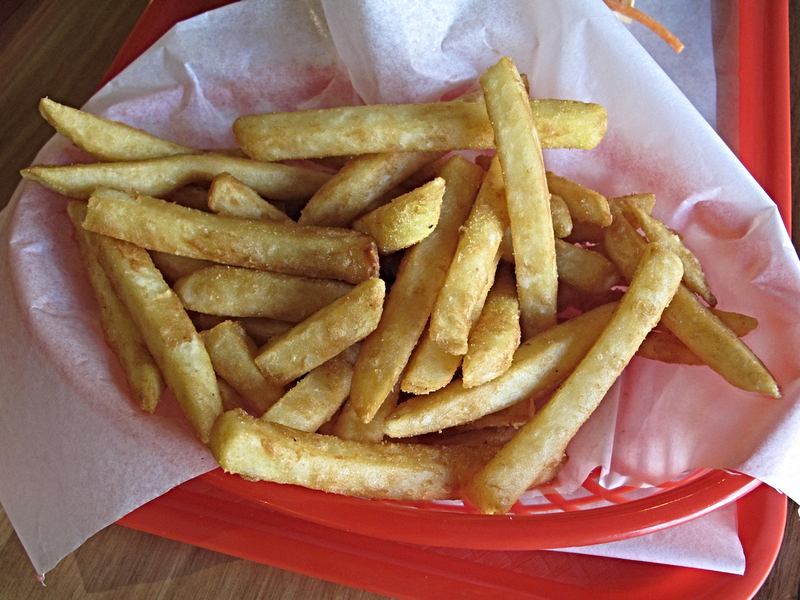 The regular order of beer-battered fries is very generous for $5. But remind me that a CTS story on this particular genre of chip will be the go come my Christmas break. How much beer – if any – is actually involved? And are they actually re-constituted spud – and thus the potato equivalent of chicken nuggets? 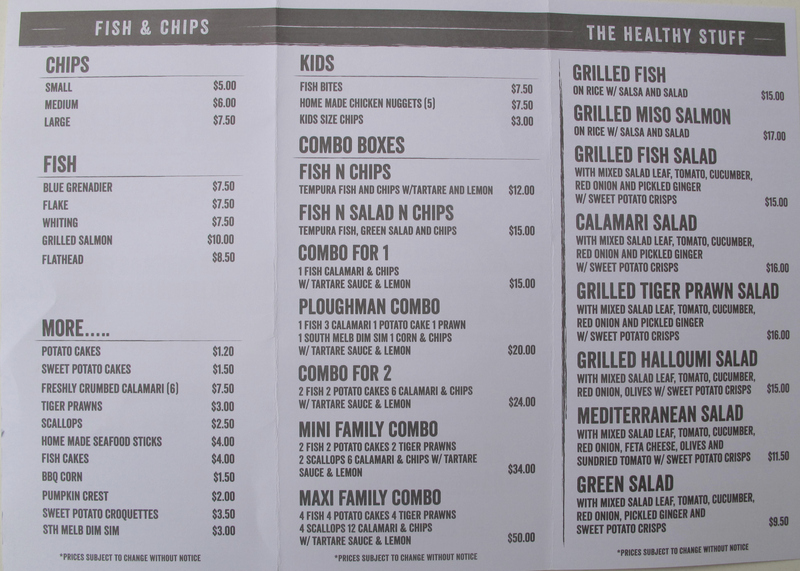 As it’s always in a state of constant prowl, food-wise, CTS doesn’t drop into Smokehouse 101 (101 Rosamond Road, Maidstone) as often as we’d like. 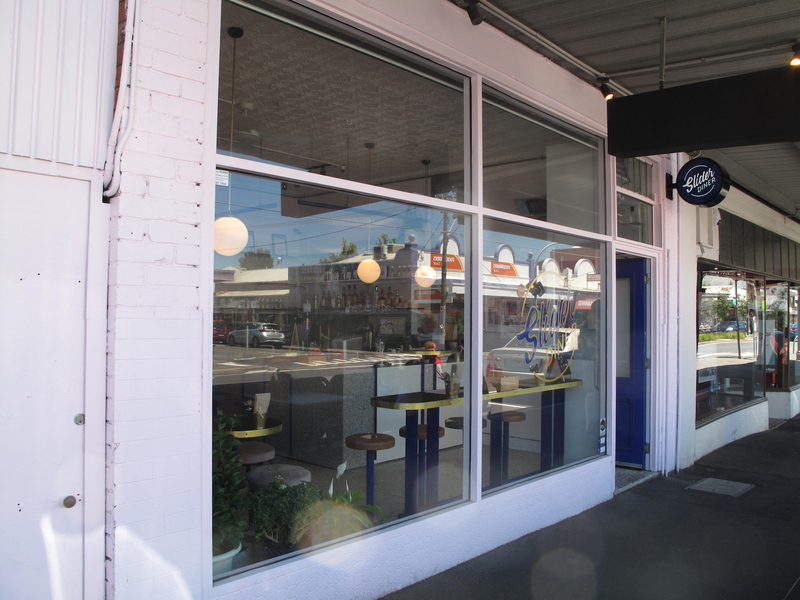 Because we like it lots that the place keeps on going about its happy neighbourhood joint business away from the often fickle, hipsterish glare that attends other establishments that specialise in barbecue across Melbourne. 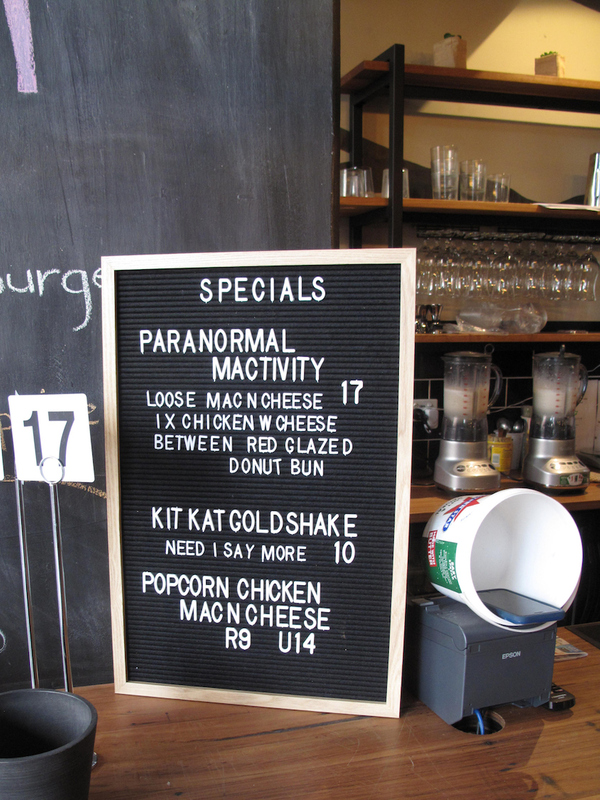 But we are in the house this Thursday to check out one Smokehouse 101’s regular specials – the Thursday night $5 burgers. Bennie had taken them for a run the previous week with a pal and has been most adamant that CTS pays an official visit. Oh, well … OK, if you insist. 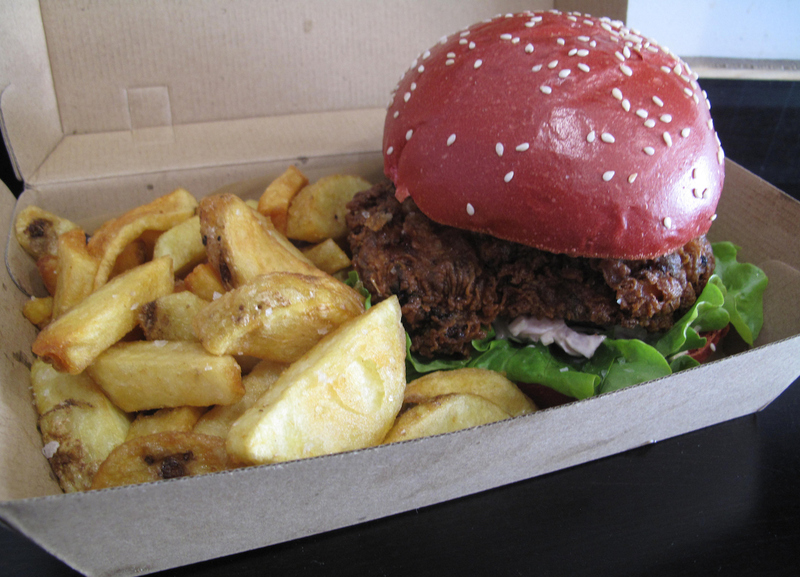 The Thursday burgers are available in beef, southern fried chicken, pulled pork and brisket. Extra patties are available for the first two named for $3 a pop. 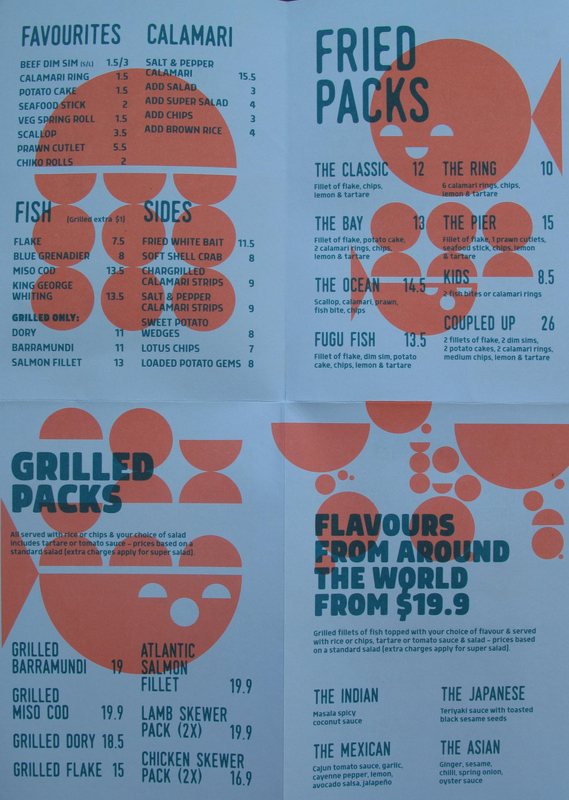 But we go a different route, ordering one each of the burgers on offer. All are dressed the same – with coleslaw and good, sliced, crunchy pickled cucumbers. I make that point because in the same week CTS bought a jar of pickled cucumbers – as recommended by the salesperson at the deli in which I was shopping – and they turned out to be soggy and tasteless. Straight into the rubbish bin they went. 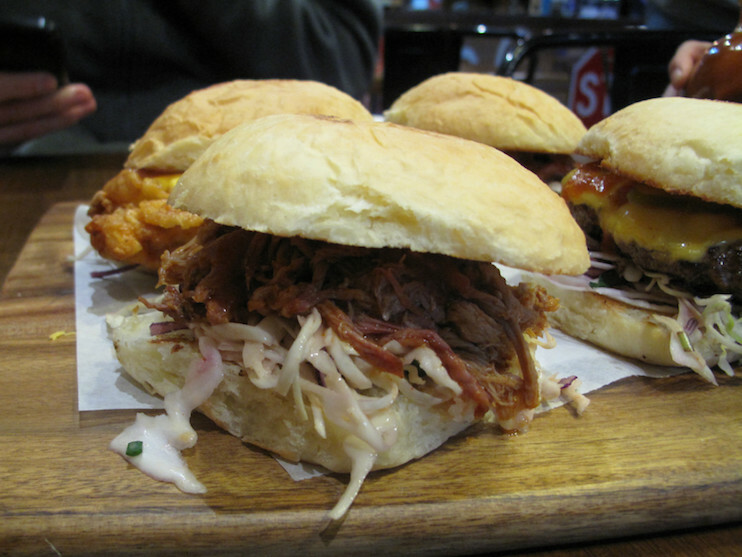 Likewise, two thumbs heartily hoisted for the most excellent house-made and toasted buns served by Smokehouse 101. The meat in our four burgers? Just fine in all cases. 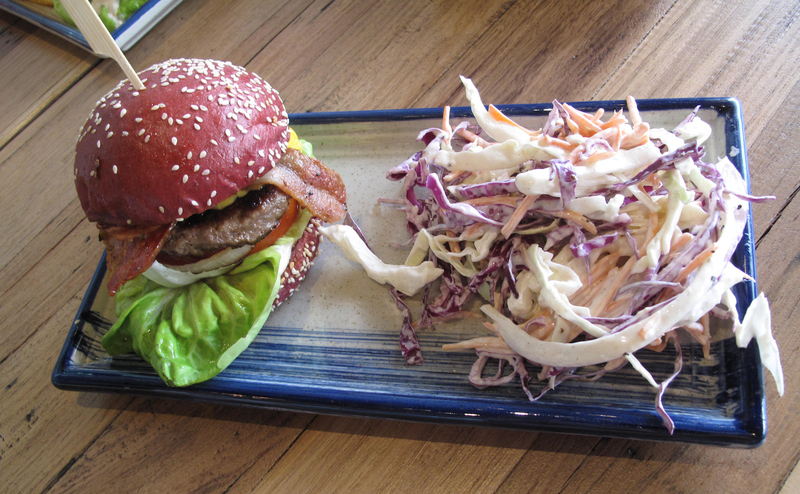 Though Bennie and I agree that the straight-up beef burger is the best of the bunch. 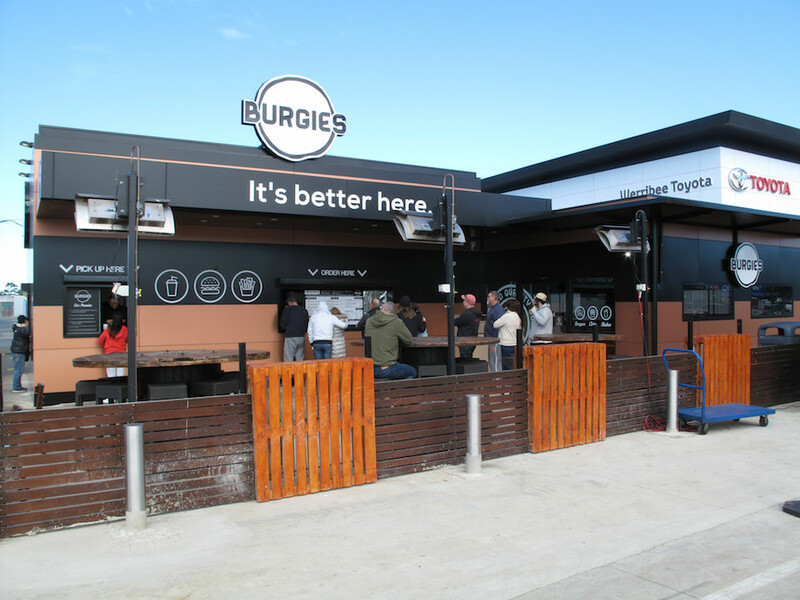 It is, of course, possible to buy burgers elsewhere for $5 or less if you want to go mega-franchise. But those aren’t burgers like these are real burgers. 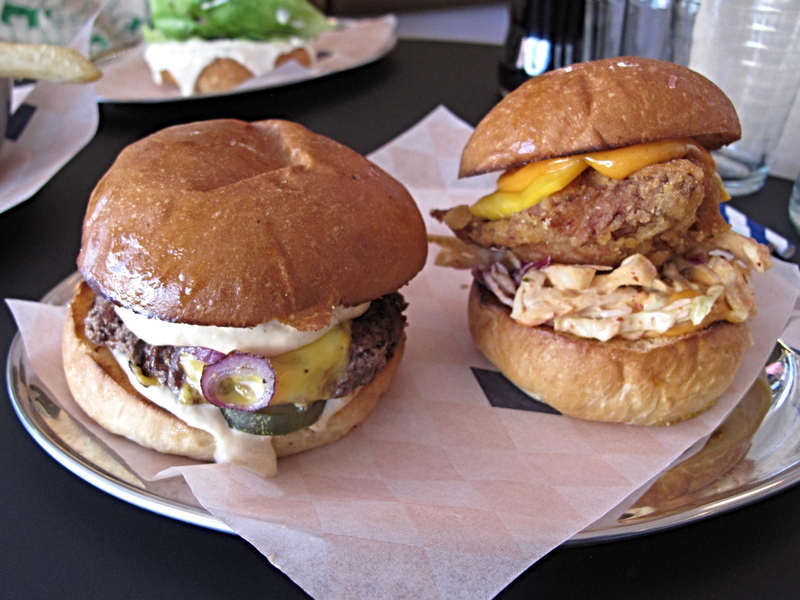 Though here it will pay to keep things in perspective and real – these ARE $5 burgers, so you won’t be getting a two-fisted hunka chunka meal, or not by ordering a single burger anyway. 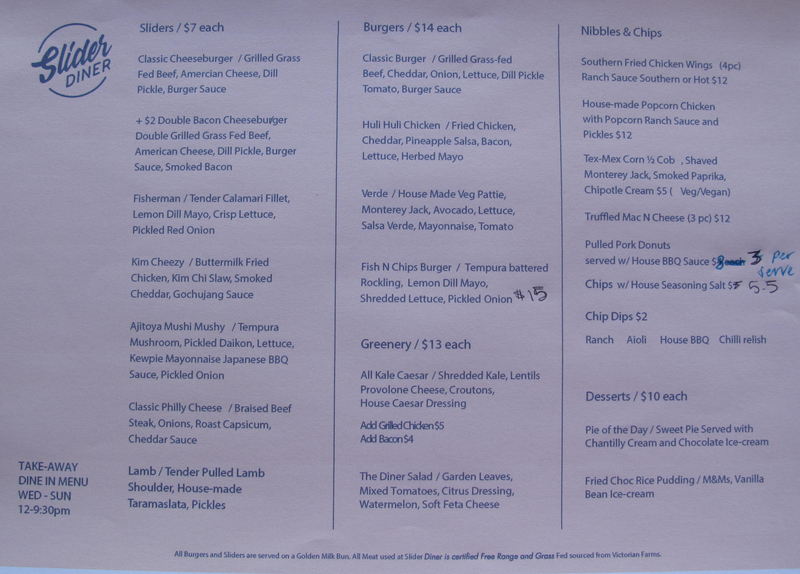 Early on our Thursday, there are only a couple of other tables taking advantage of the $5 burger deal. 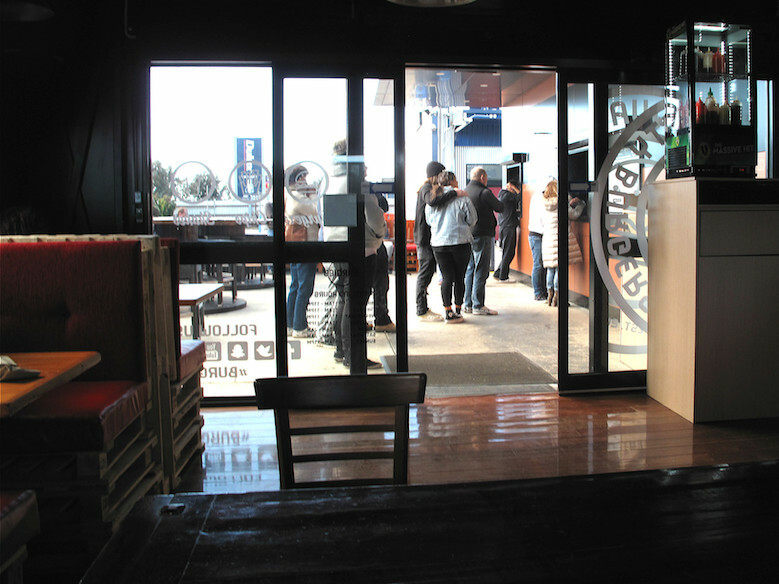 But we’re told it can get busy later on in the night, with queues out the door not uncommon. Cruise up the outer end of Somerville Road of a night and you’ll not find a lot open. Just about all the many commercial operations of many kinds have shut up shop until tomorrow. Sure, some of the freight places work way outside 9-to-5 routines. 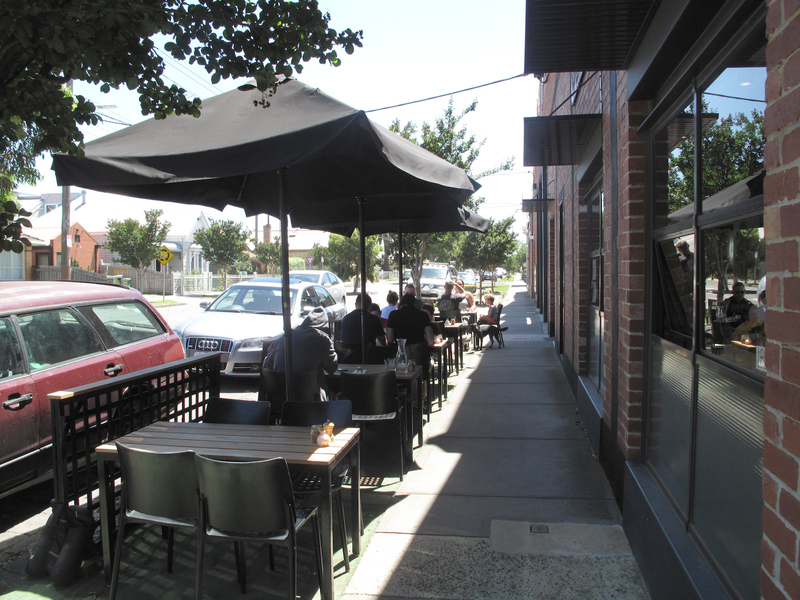 But the tradie-style cafes on almost every block are most certainly not open. 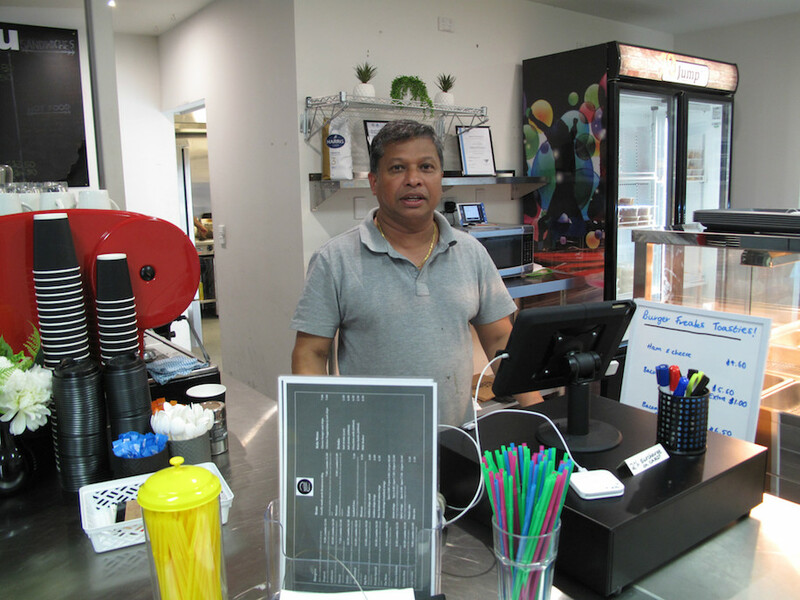 Roshan Altendorff has been running Burger Freaks for about three months, with the daytime trade all about the local, hungry workforce. 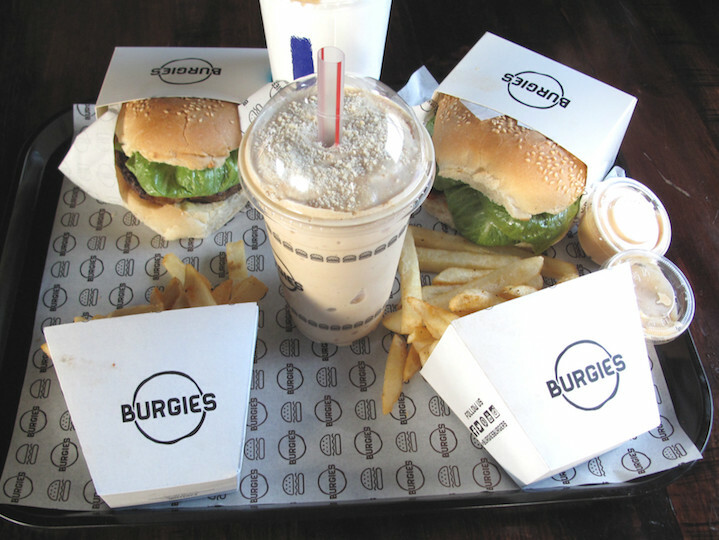 Come night-time, though, it’s all about burgers – and home delivery. 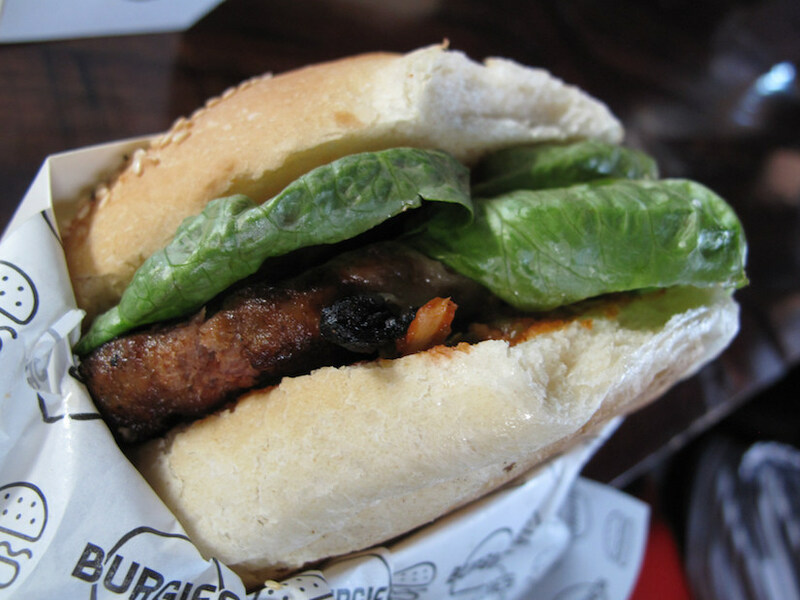 Burger Freaks is on both Menulog and Uber. 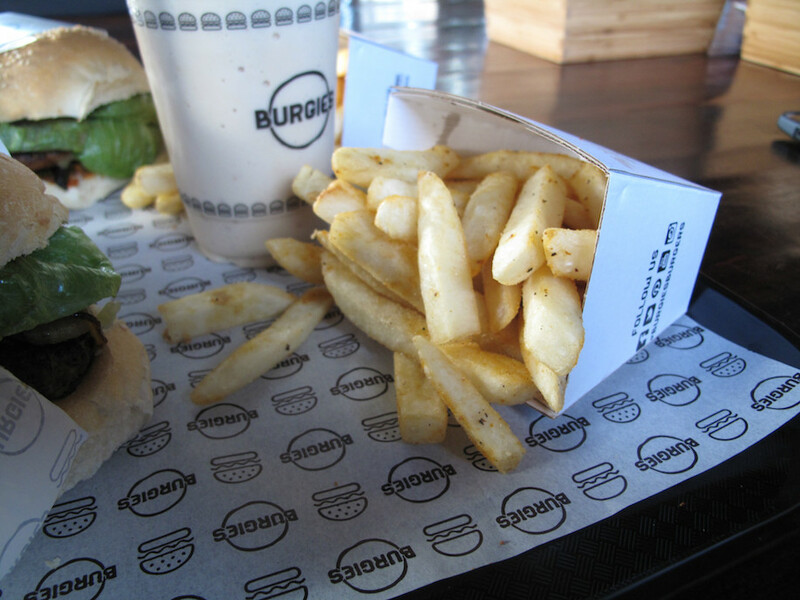 But why sit at home – and gamble with the fickle travelling ability of burgers – when you can pay a visit? 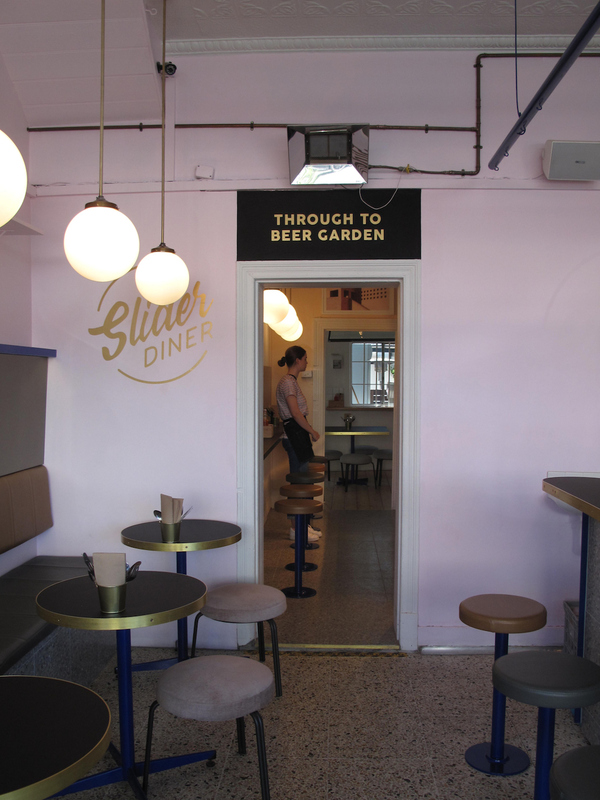 The Burger Freaks dining area is as unadorned – and virulently non-hipster – as you’re likely to find. It gets points from us for that – but it would all be for nowt if the food isn’t up to scratch. The chips ($4) are good and hot. 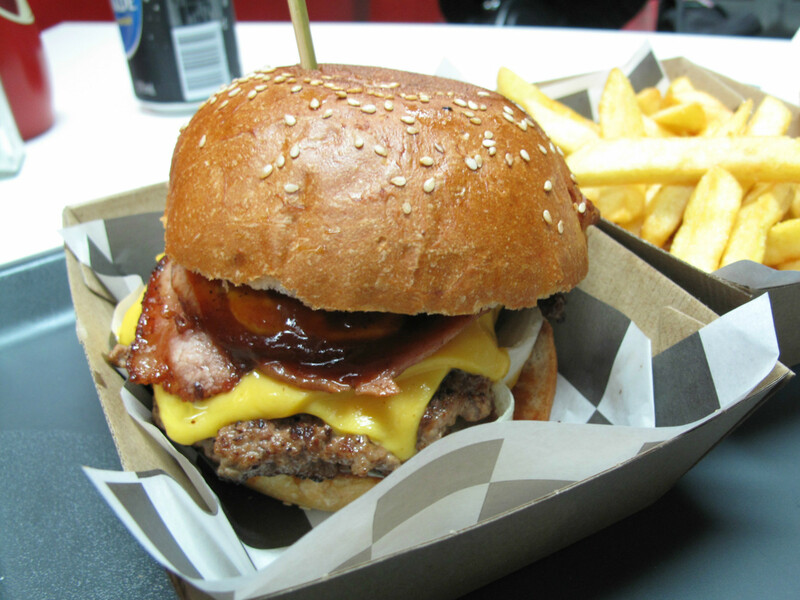 The Mate (top photo) – with beef patty, cheese, caramelised onion, beetroot, bacon, lettuce and BBQ sauce – costs $10.50 or $14.50 with chips and a can of drink thrown in. 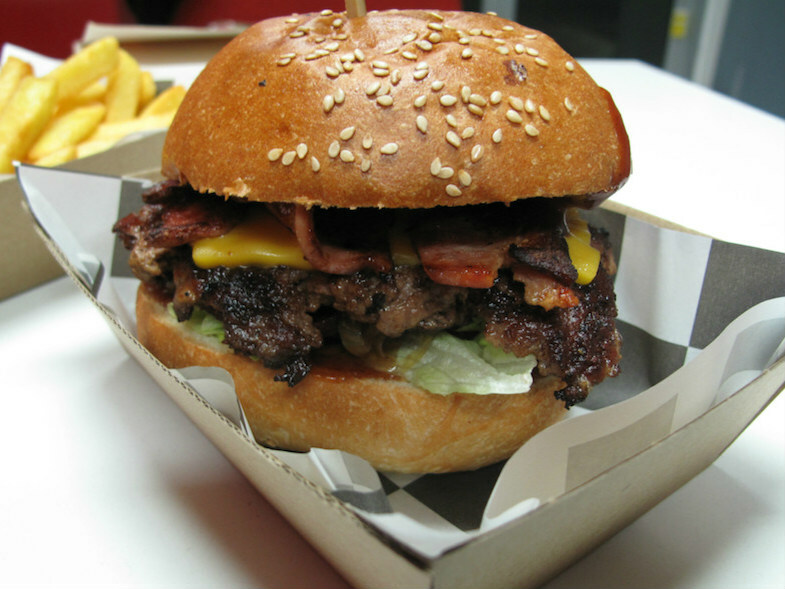 The California ($11.50, $15.50) – with beef patty, double cheese, double bacon, BBQ sauce and American mustard – is a bit more flashy. 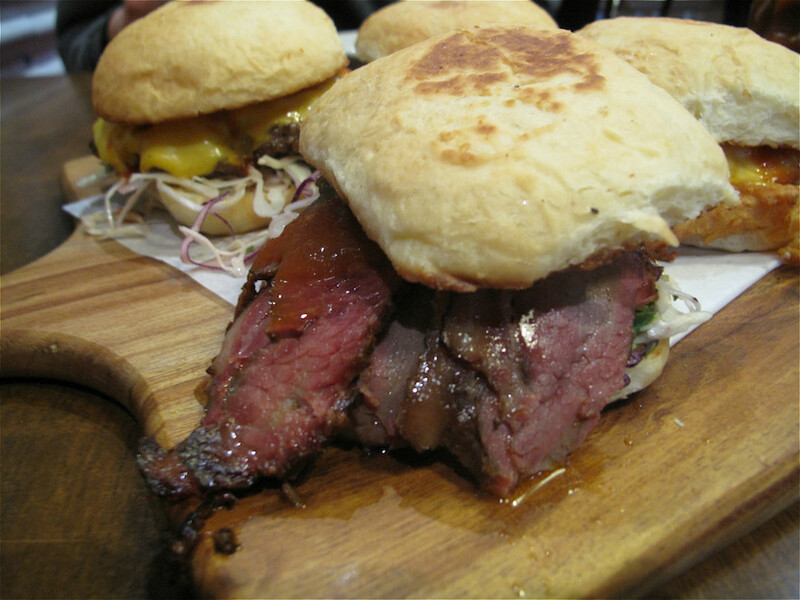 These are both really admirable and enjoyable solid, no-fuss burgers with nicely charred and good-quality meat. 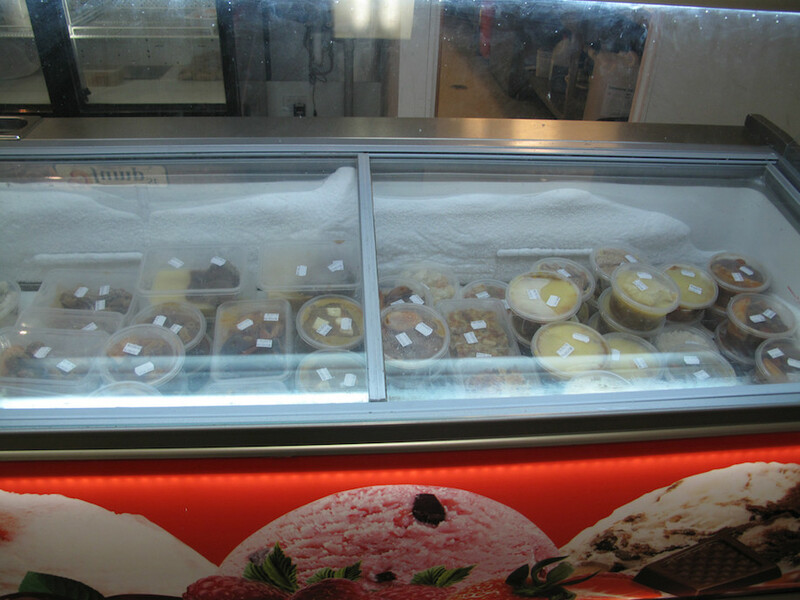 As well as burgers, this place sells a revolving range of frozen meals for $4.50 and $5.50 depending in size, as part of the UrCommunity – Feeding Australia Meal Deals project. They run to curries, pasta, stews and the like. 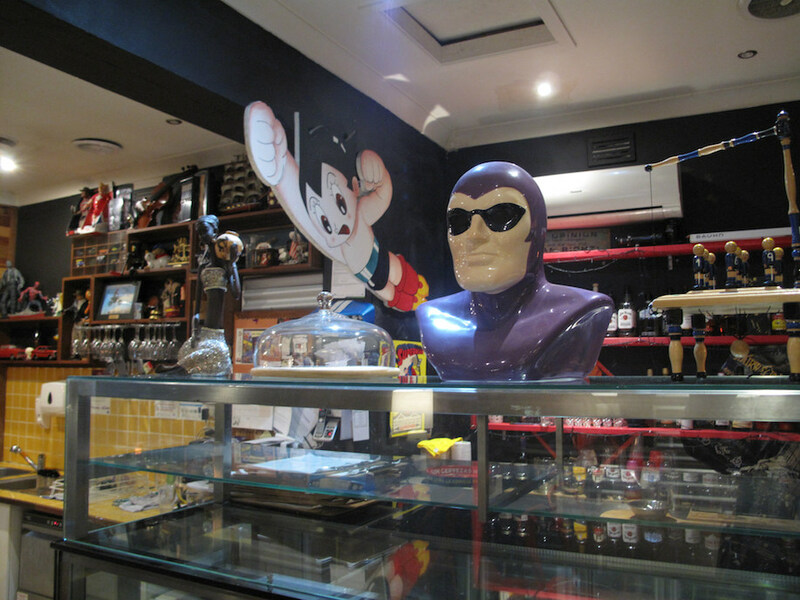 Burger Freaks is open for evening dining every night except Mondays. 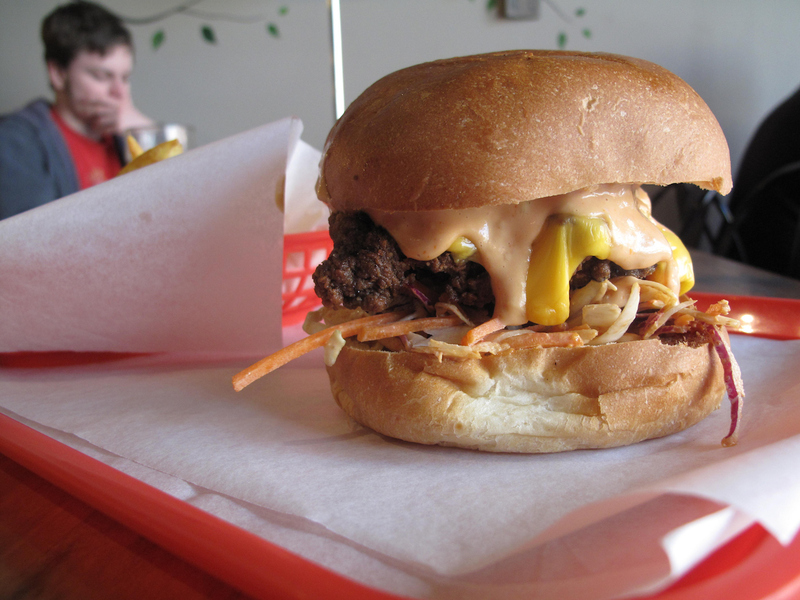 See the Burger Freaks website, including menu, here.